I was born in 1988. So, in December 1993 when the first VeggieTales video was released, I was five years old. My first memory of the series was seeing the second episode ("God Wants Me to Forgive Them!?!") when my dad (a pastor) got a copy of it from somewhere and said “I have a new show I want you to watch and tell me what you think of it.” I was awestruck by the computer animation, the great storytelling, and the fun songs. It got my seal of approval immediately. VeggieTales was on the rise, and not long after that the series became extremely popular even among teenagers for its quirky humor. I still remember the palpable sense of excitement among my peers (and my brothers’ peers!) each time a new video was released throughout the ‘90s. 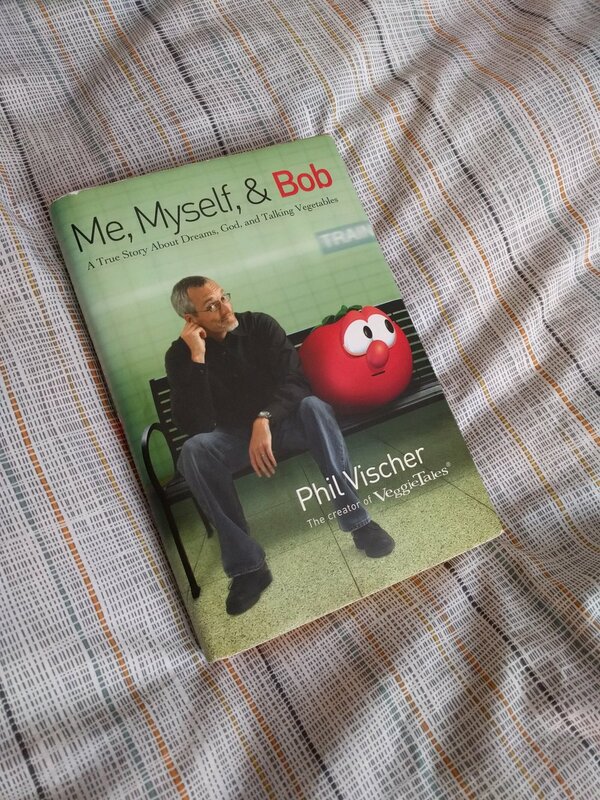 Today I finished rereading one of my favorite books, “Me, Myself, & Bob,” by VeggieTales creator Phil Vischer. I read the book for the first time eight years and eight days ago, on Jan 12, 2011. This was probably about the fourth time I’ve read the book and it was as powerful as ever for me. The book is a little bit of an autobiography, particularly at the beginning, but mostly it chronicles the creation of VeggieTales and the rise and fall of Big Idea Productions. I love the beginning of the book because I always find myself identifying so strongly with the young Phil Vischer. I also love all the nerdy details he includes about his adventures in animation. The middle of the book is a thrill ride as he recounts the wild growth of VeggieTales and Big Idea Productions and the subsequent perilous teetering on the edge of survival as its expenses outpaced its revenue. I even love reading about the company’s failure, painful as it was, because Phil describes it in a way that makes the reader feel like they were there. “We’re over here by Qwerty to talk about what we learned today.” That’s what Bob the Tomato says at the end of each VeggieTales episode, and if, by some strange oversight, you were unaware that the story you had just watched contained a valuable lesson, Bob’s statement makes it painfully clear. We just experienced something meaningful together, he’s saying, and now we’re going to talk about what we learned. Appropriately, the last few chapters of the book are about the aftermath of Big Idea Productions’ collapse and the lessons Phil learned in his own life as a result. It’s hard for me to write about this because I often find myself facing the same struggles on a regular basis. Struggles with the desire to see my dreams fulfilled by my own brilliance and perspiration and only the slightest sprinkling of God’s blessing to sanctify the effort. Struggles to achieve the things I’m sure will probably maybe make me happy. Struggles to cling to my own vision of what my life should look like. Determination to press on when things are uncertain rather than to wait on God. False certainty that my idea was from God because I came up with it while praying or prayer-adjacent. Fear that what God wants for me won’t be at all what I want for me. Desperation over the possibility that life in God’s kingdom doesn’t look as shiny as a life of American Success™. Fear of disappointing others when my Next Big Dream turns out to be Another Bad Idea. And yet, as much as these struggles and false hopes and Bad Ideas center around me taking action when I shouldn’t, the antidote is not inaction. It’s not complacency. It’s not resignation. The answer, instead, is to seek God. The problem though is that I’m exceptionally bad at this. What does it mean when God gives you a dream, and he shows up in it and the dream comes to life, and then, without warning, the dream dies? What does that mean? In the book, these words are uttered by a preacher Phil hears, one who had to deal with that question in his own life. Phil had to deal with it in his, and I’ve had to deal with it in mine. Apparently, I still am. Me, Myself, & Bob: A True Story About Dreams, God, and Talking Vegetables is and will probably continue to be among my favorite books. I’m not sure how many copies I’ve bought at this point but I keep giving them away for some reason. On a related note, one of my favorite artists, Scott Erickson, has a new show called “Say Yes: a liturgy of not giving up on yourself” which deals extensively with the concept of dreams and their deaths. I have not seen it yet, but it is coming to South Bend on February 8 and I would be honored for you to join me there.